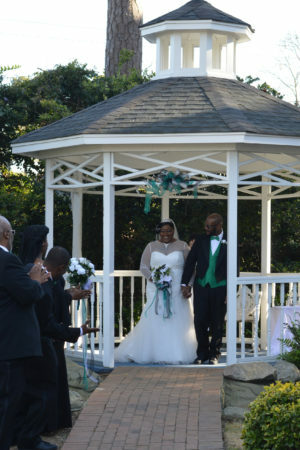 Portia Thelmeca Wade, originally of Goldsboro, NC, and Richard Orlando Hamilton , originally of Raleigh, NC, were united in marriage on Saturday, March 23, 2019 in the Gazebo at Wedding Chapel by the Sea. The Reverend Pam Muise officiated. Portia is the daughter of the late Pordis Wade Sr. & the late Thelma G. Wade and the granddaughter of the late William Waters SR & the late Jessie Mae Waters. Richard is the son of Edna Kornegay & the late Richard Hamilton and the grandson of the late Clarence Hamilton and the late Emma Jean Parker. Portia is the owner and operator of All About Taxes LCC in Goldsboro. Richard is the owner and operator of Appropriate Movers in Goldsboro, NC. After a Honeymoon in Williamsburg, VA, Richard & Portia will make their home in Goldsboro, NC. We at Wedding Chapel by the Sea wish the Happy Couple a long, love filled life together.